Meathead Movers is here to take care of the heavy lifting for you on your move to Palm Springs. Our clean-cut student athlete movers are ready to get you safely settled into your new Palm Springs home. Although most people think of California’s sandy beaches as its main attraction, Palm Springs has a distinctive appeal of its own. Located in the desert in Riverside County, Palm Springs is known for its dry heat and impressive canyon views. With a population of just over 45,000, Palm Springs has plenty in the way of arts, culture, and entertainment. If you are considering a move to Palm Springs, you should consider Meathead Movers to help get the job done. The desert surrounding Palm Springs has historically been home to the Cahuilla people, and even today, a section of Palm Springs is owned by the Agua Caliente Indian Reservation. When western expansion finally came to California, Palm Springs was first established due to the development of the railroad. The city became more popular in the 1900s when the rich and famous were drawn to its steamy sands for dry heat therapy. Even today, Palm Springs has an air of Hollywood with distinctive, modern architecture and plush resorts. Beyond that Palm Springs also has numerous recreational options, including various canyon overlooks, mountain trails, and cultural centers. In order to simplify your move here, Palm Springs movers are a smart choice. Meathead Movers has been a staple of the moving industry since 1997. 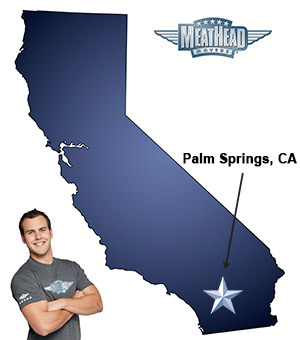 Based in California, Meathead Movers can handle any move whether it be local, long-distance, or commercial. Meathead Movers works with clients to help at any stage of the process, including packing, loading, storage, and on-site relocations. We tailor our services to fit your exact needs, ensuring that your move is quick, efficient, and affordable. Meathead Movers looks out for clients, providing premier customer service that even includes a moving concierge service, which can connect you with local service providers in the area. Meathead Movers not only offers a full range of moving services, but it also provides a commitment to excellence that is lacking in most other moving companies. To provide the best service possible, Meathead Movers employs student athletes, whom we hold to the highest standards. Our movers are respectable student athletes who don’t smoke or do drugs, and who always provide superior customer service. In order to promote productivity and save you time, all Meathead employees jog while not carrying anything. Training is completed at Meathead University, and employees are expected to remain active in the community throughout the year. Moving to Palm Springs may be a lifelong commitment. Make sure that your new life starts off right with the best Palm Springs movers. Contact us today for a free moving quote. Moving to Palm Springs? Here are some helpful resources. View more Palm Springs resources. Amazing group of guys. Extremely professional and courteous. Amazing job, made moving so much easier! Everyone was great, from Tommie, with whom I spoke on the phone, to Taylor, the driver and his crew (let's see how well I remember: RJ, Jesus, Toa--oh, shoot, I can't remember the other two names). They were all nice, respectful, careful with my possessions, fast, nice to be around, easy-going, etc. The three young men, Nate, Nick & Diego, that took care of my move were excellent. They showed up on time, hustled, arrived at our destination very timely in spite of heavy traffic. Kept me informed of their progress via cell phone. Dealt with a somewhat cumbersome unloading (5th floor) situation very professionally. Couldn't have ask for better service. Brand new wood bed is totally scratched. Are you willing to do anything about it?